Lori Shutter, MD, was part of a six-person, international medical education team from the University of Pittsburgh School of Medicine (UPSOM) to visit and collaborate with colleagues at the Nazarbayev University School of Medicine (NUSOM) in Astana, Kazakhstan. During the five-day visit from November 12-16, 2018, Dr. Shutter and her NUSOM colleague Vitaliy Sazonov, MD, finalized the design of a curriculum for a Critical Care Medicine clerkship for fourth-year medical students. “Due to the overlap between Critical Care and Acute Care/Emergency Medicine Care, we worked very closely with the EM team to make sure the two curricula complemented each other and avoided redundancy,” explained Dr. Shutter, who is Vice Chair for Education in the Department of Critical Care Medicine and Director of the Neurocritical Care training program. She added that the curriculum for the Critical Care clerkship was designed to be similar to that used for Pitt 4th year medical students. 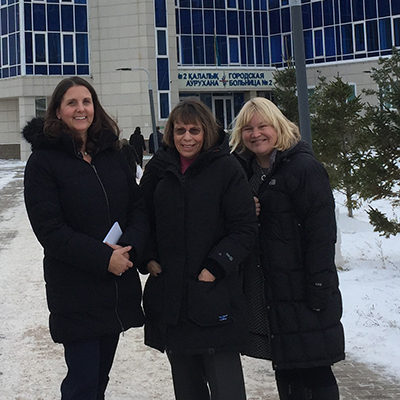 The Pitt team finalized the curricula for several different clerkships, developed assessment tools, and toured the Nazarbayev University School of Medicine facilities in order to optimize use of local resources. UPSOM sent a six-person team of medical education experts including Drs. Michael Elnicki Medicine), Michael Decker (Pediatrics), Kristiina Parviainen (OB-Gyn), Stephanie Gonzalez (Emergency Medicine), Greg Watson (Surgery) and Lori Shutter (Critical Care). The University of Pittsburgh School of Medicine is a strategic academic partner with Nazarbayev University School of Medicine, which strives to educate science-based, skilled and compassionate clinicians who are leaders in clinical research and humanistic care. NUSOM opened 2015 with the inaugural class entering their fourth year of medical studies in fall 2018. All classes are taught in English.